It's a sweet life living by the salty sea. Shrimp. Pasta. Spicy cream sauce. What’s not to love here? This Cajun chicken pasta has long been one of our weeknight favorites. Comes together so quickly and easily, it’s a dish I know I can always turn to on those nights where I want something good and comforting – but I don’t feel like putting that much effort into dinner. Sprinkle 2 teaspoons Cajun spice over the shrimp, toss to coat. Heat 2 tablespoons olive oil in a heavy skillet over medium-high heat. Add shrimp to skillet, and cook for about 2 minutes. Flip shrimp over and cook for 1 minute more. Remove to plate and set aside. Add remaining tablespoon of olive oil and heat until shimmering. Add peppers, onions, and garlic. Sprinkle on remaining Cajun spice, and add salt if needed. Cook over medium high heat until peppers and onions are tender. Remove all vegetables from the pan to a plate, and set aside. With the pan over high heat, pour in the wine and chicken broth. Cook on high for 3 to 5 minutes, scraping the bottom of the pan to deglaze. Reduce heat to medium low and pour in cream, whisking constantly. Cook sauce over medium-low heat for a few minutes, until cream starts to thicken the mixture. Add cayenne pepper, salt and pepper to taste. Add the vegetables to the sauce. Stir and cook for 1 to 2 minutes, until mixture is bubbly and hot. Add drained fettuccine and toss to combine. Serve spicy shrimp on top of pasta. Sprinkle with scallions for garnish. You know I have a pasta obsession…this looks amazing! 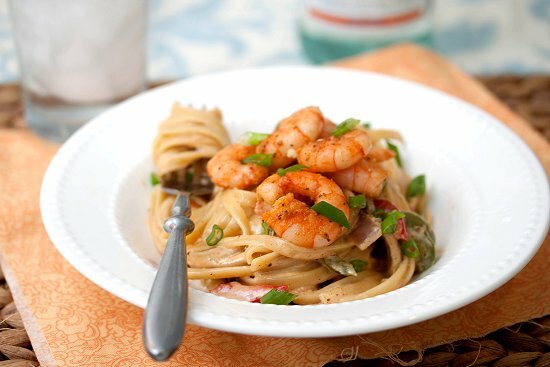 Shrimp pasta dishes are the best – they’re the epitome of easy weeknight dinner! Love the flavors in this pasta! I hope that you enjoyed your stay, and this little glimpse of my life here on the Eastern Shore. Have any questions or comments? Feel free to drop me a line anytime. © Copyright 2018 Tide & Thyme. All rights reserved.